Real Art Ways presents new large scale paintings by Gil Scullion. 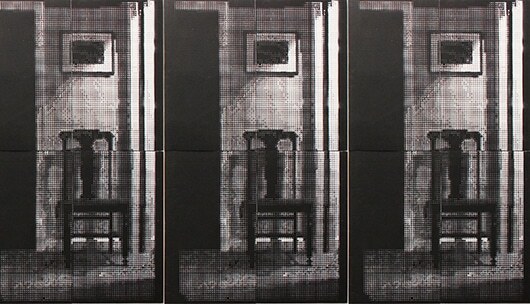 Using hand-cut stencils on cardboard, Empty Spaces utilizes imagery culled from uninhabited hallways, kitchens, and other domestic scenes. The resulting paintings contain an eerie sense of familiarity, upended by the lack of bodies these spaces are meant for. Scullion’s use of the photomechanical texture of halftones as well as repetition furthers the less-than-human feeling of these pieces. Gil Scullion is an artist living and working in Middletown, Connecticut. Upon finishing his undergraduate studies, Scullion moved from Austin, Texas to New York City. There, his work developed in a conceptual manner before he pursued graduate studies at the State University of New York Albany. His work has been featured at Real Art Ways, the De Cordova Museum in Lincoln, Massachusetts, the New Britain Museum of American Art in New Britain, Connecticut, P.S.1 in Long Island City, New York, the Wadsworth Atheneum in Hartford, Connecticut and the Housatonic Museum of Art in Bridgeport, Connecticut. He has taught for the Graduate Liberal Studies Program at Wesleyan University and Manchester Community College. His work has received support in the form of grants from the Berkshire Taconic Community Foundation, the Hartford Downtown Council and the Middletown Commission on the Arts.